Clemson Girl: There are no guarantees in College Park, Maryland... Clemson vs. Maryland game prediction. There are no guarantees in College Park, Maryland... Clemson vs. Maryland game prediction. The last time Clemson won at Byrd Stadium was in 2007, a 30-17 victory, better known as the James Davis guarantee game. The Clemson running back promised Tiger Nation that they would return home with a victory and the Tigers delivered. No matter who is the better team or how many games each team has won, the Maryland Terrapins are always a tough opponent for the Clemson Tigers. From 2005 to 2008, the visiting team came away with the victory, but for the last two years, the home team has pulled the upset. 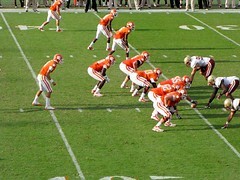 In 2009, the future-ACC Atlantic Division champion Tigers lost 24-21 to a two-win Terrapin team. Last year, the nine-win Terps lost 31-7 to a 6-7 Clemson squad. Can Clemson (6-0, 3-0) avoid the upset against division foe Maryland (2-3, 1-1) on their Homecoming night? There’s a quarterback controversy brewing in College Park with Danny O’Brien, the sophomore starting quarterback, being yanked in favor of back-up C.J. Brown in the Terps’ loss to Georgia Tech a week ago. The starter won’t be named until game time and each presents a different set of problems. O’Brien is more of a pocket passer who can pull it down and take off. He is 97-for-156 for 930 yards, four touchdowns and six interceptions. C.J. Brown is more of a running quarterback who can also throw. He is second on the Terps in terms of rushing. He has carried the ball 11 times for 153 yards and a touchdown. His career-long is 77 yards which came last week against Georgia Tech. Running back Davin Meggett leads the team with 83 touches for 413 yards. Clemson defensive coordinator Kevin Steele will probably have a game plan similar to the one last week against Boston College. The Tigers will load the box with defensive linemen and linebackers to stop the Terp rushing attack and force the Maryland quarterbacks to throw the ball. Just as with Maryland, the biggest question for the Tigers is the health of quarterback Tajh Boyd, who suffered a hip injury against Boston College. Boyd says that he is ready to go, but Maryland’s defense will go after him and try to take away the threat. His running capabilities have been a huge part of Clemson’s offense this season, and he has really shown those abilities over the last couple of weeks, even running one in from 14 yards out against Boston College. Clemson wide receiver Sammy Watkins has been a freshman phenom this season with three games of over 140 receiving yards and he is only one 140-yard game away from tying Perry Tuttle’s record of four games in a career. And, welcome to the big time Dwayne Allen. Allen is second on the team in receiving with 22 catches for 340 yards and four touchdowns. He is a matchup nightmare for defensive coordinators - with all of the wide receiver weapons that Clemson possesses, opponents have to put a linebacker on him and linebackers just can’t keep up with the speedy 6-4, 255-pound tight end. Clemson kicker Chandler Catanzaro has finally become the kicker everyone thought he could be, making all five of his kicks in last week’s win. He is a very consistent 10-for-12 on field goals this season. Mister Reliable, punter Dawson Zimmerman, has also been stellar all season and has taken over the kick off duties in place of the injured Spencer Benton. Maryland is always a tough one for the Tigers no matter the team records or the location of the game, and I don’t see that changing this year. With this game being at night and the game being the Terps’ Homecoming, I look for this to be a close game heading into the fourth quarter. The X-factor will be the return game, and against Maryland the Tigers usually have BIG success - Don Kelley had 223 total return yards in 1970; Doug Thomas had a 98-yard return in Baltimore; in 1991, Darnell Stephens had an 89-yard punt return; in 2001, Derrick Hamilton had 100-yard kickoff return; in 2009, C.J. Spiller, wearing just one shoe for most of the return, had a 92-yard kickoff return for a touchdown; in 2010, Andre Ellington had an 87 yard kickoff return for a touchdown, and Jaron Brown had a 41-yard punt return to set up a score in that game as well. On a big special teams play, Clemson spoils the Terps’ Homecoming. Post written by ClemsonGirl.com sports blogger, Nikki Steele. LOL, need to reverse that!